A Detroit-native, Zena Patillo came to Grand Rapids over three decades ago to attend Grand Valley State University. Utilizing her master’s in human resources, with an emphasis on training, Patillo launched a consulting firm, Training Paradigm, LLC, which provides human resources and organizational development training, project management, and strategic planning assistance. Securing contracts in Michigan with organizations including: the State of Michigan, Michigan Rehabilitation Services, and the Juvenile Detention Center, as well as subcontractor roles with the city of Dallas, Patillo and her team are no strangers to working on larger opportunities. Despite this, it hasn’t been an easy journey and Patillo says she’s still not where she wants to be. “I have not yet grown to the state that I would like to. I still need to grow. Because you are small and you don’t get some of the contracts you want, it’s always a constant grind,” she says. Due to the nature of small business cash flow, sometimes this may be taking a step back and focusing your attention elsewhere so you can continue investing in your business. When it comes to pursuing contracts, like many small business owners, Patillo has often second-guessed herself or received pushback from the potential clients. Not having access to the same resources as larger businesses has also been a struggle. “Sometimes I’ve felt like I was too small to even bid on some of the bigger contracts or my brand wasn’t well-known enough,” she says. It can be easy for small businesses, especially new businesses, to be overlooked during these processes. “It’s like when you first graduate college [and] no one will give you a job because you don’t have experience. But how do you get it, if no one hires you?” says Patillo. 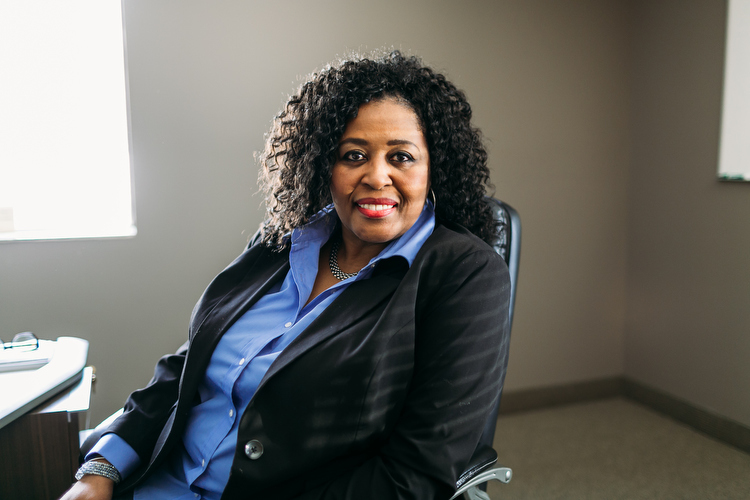 As a minority business owner, Patillo has also seen where her lack of social capital was detrimental. Having been in Grand Rapids for several decades now, Patillo can see the changes taking place, as well as continued opportunities for growth. “What amazes me is that I’ve been here 30 years and we’re still talking about the same thing as it relates to diversity. But diversity is not inclusion. Inclusion is something that you have to be intentional about. I think that it is the right thing to do. There are noted benefits to business and community that diversity brings. Even having the right people at the right tables does not solve all of the problems. Sometimes the onus lies with the individual to step out of their comfort zone and seize the moment – and think beyond just selling. “Go out and about! Go to [events], join [groups], you have to meet people. [Get involved] with things where you can build relationships with people. Don’t seek something from [people]. Build a relationship. What can you give them? Don’t be in ‘sell-mode’ all the time,” Patillo encourages. Another challenge may be getting out of your own way, Patillo argues. As your social capital develops and your network grows, sometimes the first step may be vocalizing your issue or need. “Don’t be afraid to ask. Sometimes we’re so prideful. We don’t know how to do something [but] we don’t want people to know we don’t know how to do it because then it looks like we don’t know what we’re doing. Then you miss an opportunity when you’re afraid to let someone help you or you’re afraid to trust. As small business owners, we have to stop doing that. We have to speak up. Through your networking, you can possibly find someone that can assist you. If not, [take advantage of] some of the entrepreneurial programs [like] GROW [and] SpringGR where people are going to stick with you and work with you. Building Bridges is a series focused on the diverse entrepreneurial community within the West Michigan region. Throughout the year, the series will highlight the unique problem solvers and change makers who seek to positively impact the growth of the economy and local ecosystem. Building Bridges is supported by Grand Rapids Opportunities for Women (GROW). About Leandra Nisbet: Leandra Nisbet, Owner of Stingray Advisory Group LLC and Co-Owner of Gold Leaf Designs LLC, has over 14 years of experience in leadership, sales & marketing and graphic design. Through these organizations, she assists businesses with creating strategies for growth and sustainability through: strategic planning, marketing concept development/implementation, risk management solutions and financial organization. She is actively involved in the community, sitting on several Boards and committees, and has been recognized as one of the 40 Under 40 Business Leaders in Grand Rapids.